The Jani Haenke Young Musicians project is an exciting initiative introduced in 2013 by the Stradbroke Chamber Music Festival, in association with the Jani Haenke Charitable Trust. In the week before the festival proper, a quartet or trio of student musicians from the Queensland Conservatorium, Griffith University come to the island to benefit from an intensive period of chamber music and ensemble development under the guidance of experienced professional musicians. In 2018, the JHYM program included group coaching by festival performers, individual lessons on chamber music repertoire, and playing and learning alongside festival players. The quartet were (from left) Harry Egerton, violin, Sola Hughes, violin, Murray Kearney, viola, and Francesca Masel, cello. 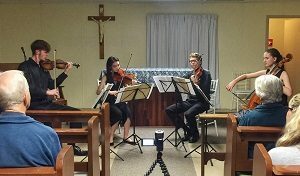 They performed a wonderful concert for festival sponsors during the week, at the St Peter Chanel Church, Point Lookout. These four young musicians, together with cellist Louise King, also performed for the students at Dunwich State School, introducing them to some of the amazing effects produced by their stringed instruments, before delighting them with some lively ensemble pieces. How fortunate to be mentored by Rachel! 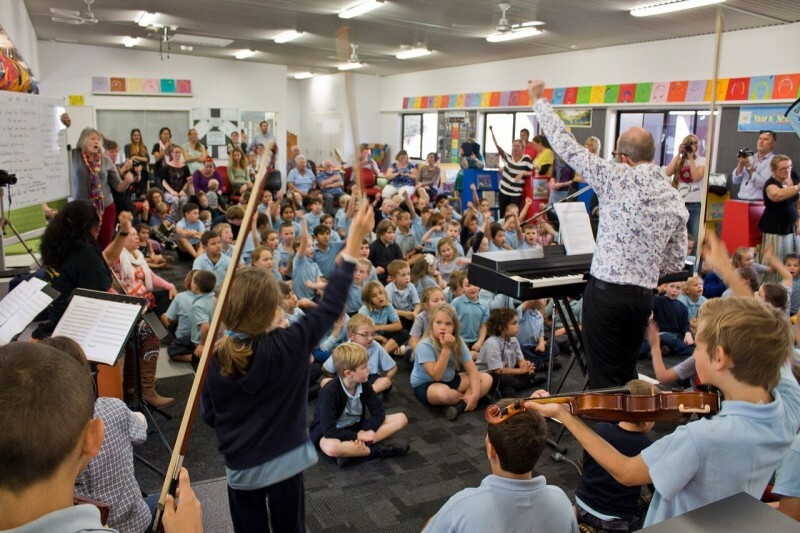 Since the festival’s inception, we have made it a priority to develop an educational program to provide tuition and musical inspiration to the students of the Dunwich State School. In the lead-up to the festivals, the musicians have conducted workshops at the school in order to further the students’ instrumental skills, and to provide them with opportunities for close learning and playing with professional musicians. In 2014, in the week before the festival, cellist Louise King directed an interactive musical re-telling of the Aboriginal Dreamtime story of Tiddalick: The Frog Who Caused a Flood. She worked with all the students at the school so that they could be involved in their own creative way in the Tiddalick performance, using not just their musical skills but also skills in conducting, composing, movement and dance. 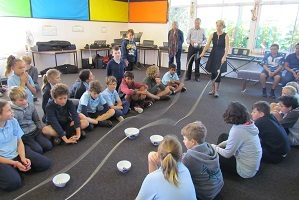 The project culminated in a performance at the school, which also involved members of the Stradbroke Island Singers community a cappella group. In 2015, the festival commissioned Berlin-based Australian composer Paul Hankinson to write, in collaboration with the students, an iconic song that could be performed at future events involving the school. Using ideas contributed by everyone at the school, Paul first created a musical draft. The draft was then developed in a series of student workshops, focusing on the elements of rhythm, melody, harmony and lyrics. Finally, on 23 July 2015, the different strands of the song, now titled ‘We Are One’, were brought together at a rousing performance for the whole school and members of the public. A year later, in the week before the 2016 festival, Grammy-award-winning flutist Tim Munro delighted the students with his whimsical virtuosity, and Paul Hankinson came back to reinforce the work the students had done on the school song. They now have a recording of themselves singing ‘We Are One’, accompanied by festival musicians. 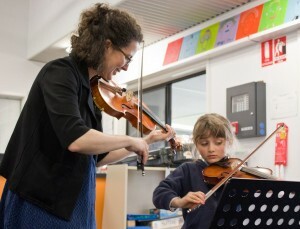 Funding support for composition of the song was provided by the Sidney Myer Fund’s Small Grants Program in Education. 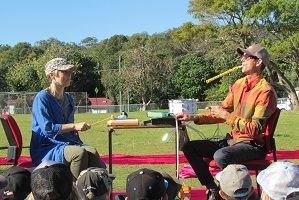 In 2017, the festival provided another special musical treat for the young people at Dunwich State School, with a visit from Clocked Out (Erik Griswold and Vanessa Tomlinson). This Brisbane duo are well known for their experiments with percussion, piano, found objects and toy instruments. 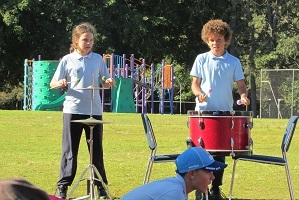 They worked with the students to explore sound-making techniques with percussion and everyday objects, culminating in a spectacular outdoor performance of an island-themed musical soundscape.